Birthday freebies are not just served on one day. Most restaurant birthday coupons are valid from 7 to 30 days. Imagine this: you’re out with your best friend celebrating your birthday. You’re enjoying a big, juicy burger before digging into a rich, delectable slice of chocolate molten lava cake. The bill arrives and your friend insists on treating you. You smile and say not to worry– your meal is already free! Yes, you read that correctly: if you play your cards right, you can dine out for free the entire month of your birthday. That’s 30 days of free drinks, free appetizers, free desserts, free coffees and free meals. Really! Just a decade ago, if you wanted to eat for free in conjunction with your birthday you’d have to show your driver’s license on your actual birth date. This meant that if you wanted to enjoy more than one birthday meal you’d have to crisscross town multiple times on your actual birthday or risk losing out on a freebie. Landing killer birthday freebies were almost more effort than they were worth! Good news, birthday deal chasers: eating out for free is no longer limited to your actual birth date. Many restaurants now offer birthday freebie coupons that are valid the ENTIRE month of your birthday. Scoring a birthday freebie is pretty straightforward: simply sign up in advance for the restaurant’s e-birthday club and you’ll be emailed a coupon to redeem during your birthday month. 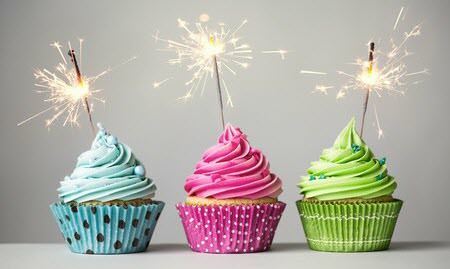 Most birthday coupons are valid from 7 to 30 days. Yep, it’s that easy! Check out our Eat Out for Free During Your Birthday Month article to get the full scoop on how to maximize your birthday freebies. Also, keep in mind that when you sign up for a birthday eClub, you’ll get a coupon for immediate use as a sign-up bonus. If your birthday is a few months out, be strategic in your club signups. Pace yourself so you can use all the instant coupons! Find restaurants in your zip code offering free birthday meal coupons with this online birthday deal finder. As the top ranked restaurant on our Top 10 list, Applebee’s devotees will love the free entrée deal with the purchase of any one full priced entree. From the house sirloin to a handcrafted burger, your birthday month is the month to go big! The Applebee’s coupon is valid for thirty days effective on your birth date. Sign-up bonus: Receive a 99-cent appetizer special with your purchase of any entrée; choose between select appetizers and bar snacks. Thirty days to use this coupon too. Unlike some of the other restaurants on this list, you’ll need download the Starbucks App or buy and register a Starbucks card to participate in this deal. Once that’s done, you’ll receive a free birthday reward for ANY drink or food item in the store. Whether you’re craving a refreshing Frappuccino, a rich buttery almond croissant or one of the new Fizzio handcrafted sodas, this treat is free on your birthday. Starbucks rules you must claim your reward on your exact birthday or 1 day before or after your birthday. 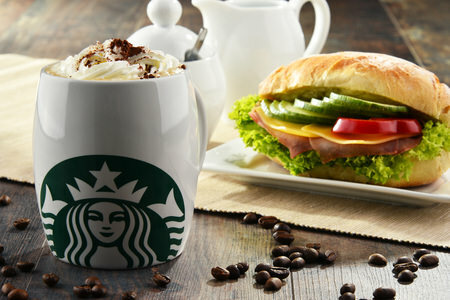 Choose anything on the Starbucks menu including sandwiches and flatbreads. Starbucks birthday reward is any hot or cold beverage, or bottled drink, or any food item. Your chance to try an exotic drink, interesting pastry or healthy sandwich. Sign-up bonus: When you register your Starbucks card, you’ll be eligible for a host of great benefits. Earn bonus stars on purchases, unlock free in-store refills on hot or iced brewed coffee and tea at the Green Level, and start earning free drinks and food at the Gold Level. Watch your in-box to earn Bonus Stars and extra discounts! What could be better than the all-you-can-eat paradise that is Golden Corral? A FREE adult buffet! That’s exactly what you’ll score for your at Golden Corral as a member of the “Gold Club”. Get a free adult buffet with the purchase of any one full-priced adult buffet. You’ll have 14 days to use Golden Corral’s birthday coupon. Sign-up bonus: Receive a free beverage with the purchase of an adult buffet when you sign up for the “Gold Club” email rewards program at Golden Corral. Happy Free Grand Slam day to you! Visit Denny’s on the day of your birthday and present your ID upon ordering to earn a free Grand Slam breakfast. Be sure to sign up for the Denny’s Rewards program in advance so you’ll get the free grand slam breakfast coupon on your birthday. You’ll also need to print the coupon and present it in person. Sign-up bonus: Receive 20% off your entire guest check when you sign up for the Denny’s Rewards program– the first of many perks that will soon be headed to your inbox! Sign up for the Pancake Revolution email list and receive an immediate coupon for a FREE full stack of Rooty Tooty Fresh ‘N Fruity Pancakes — AND another for your birthday AND another on the anniversary of when you signed up! Cake should be part of the celebration, right? Elevate your cake game on your birthday with IHOP, where you’ll score a full stack of FREE Rooty Tooty Fresh ‘N Fruity Pancakes. Join IHOP’s eClub dubbed the “Pancake Revolution” in order to score this deal. You can choose from peach, cinnamon apple compote or glazed strawberry. 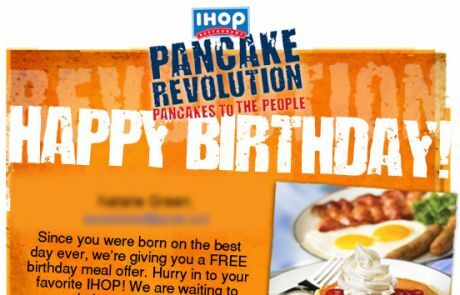 No need to visit on your actual birthday; IHOP’s coupon is valid for 14 days from the date of the email. Sign-up bonus: When you join IHOP’s “Pancake Revolution” club, you’ll also be emailed a coupon for a free Rooty Tooty Fresh ‘N Fruity Pancake breakfast. Be strategic about when you join the club. Since this sign-up offer and the birthday bonus are both valid for 14 days, you’ll want to space out your sign up so you don’t get stuck having to use both offers to close to one another. Pancakes to the people! Treat your taste buds right during your birthday month with a FREE birthday burger reward as a Red Robin Royalty account holder. The birthday offer includes all gourmet burgers and chicken sandwiches and is redeemable any day during the month of your birthday. There are 16 Gourmet Burgers to choose from: Grilled Turkey, Bleu Ribbon, Whiskey River BBQ, A1 Peppercorn, Royal Red Robin, Banzai, Garden Burger, Patty Melt, Chili Chili Cheeseburger, Keep It Simple, Bacon Cheeseburger, Guacamole Bacon, Prime Chophouse, Sauteed ‘Shroom, Gourmet Cheeseburger and Burnin’ Love. Sign-up bonus: When you sign up for a Red Robin Royalty account, you’ll be eligible for a special offer. Visit five times within the first month and receive $20 in rewards money towards your sixth visit. Moe’s generous birthday coupon is good for any entree on their menu. 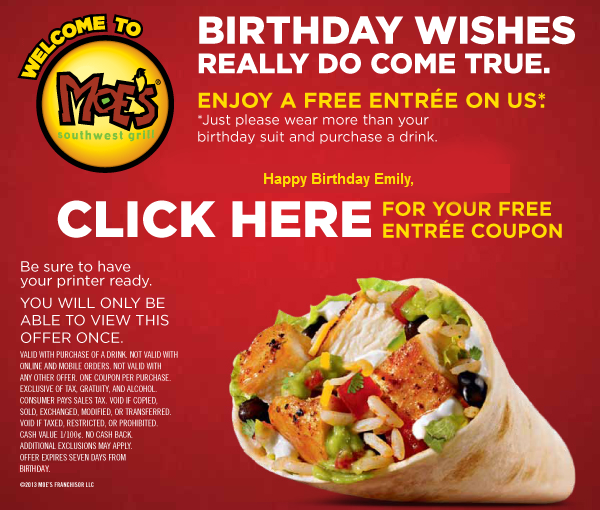 At Moe’s Southwest Grill, your birthday wishes really do come true with a free entrée. Just purchase any drink to land the free entrée– and be sure to wear something other than your birthday suit. Be ready to print your offer as soon as you open it– you’ll only be able to see it once! Your free entrée offer expires seven days after your birthday. Sign-up bonus: Welcome to the club! When you join Moe’s rewards program, you’ll earn a free 6 oz. cup of queso. The offer expires seven days after sign-up. Crave Connection is the parent email club for Old Country Buffet, Ryans, Hometown Buffet, Country Buffet and Fire Mountain. Head straight to their signup form Crave Connection for directions on which club to join. The sign-up form will direct you to the buffet brand closest to you. On your birthday, you’ll be emailed a coupon for a free adult buffet dinner that’s good for up to 14 days including your birthday. Sign-up bonus: Score a free adult buffet dinner when you sign up for Crave Connection. Ruby Tuesday wrapped your present in a bun this year: it’s a free birthday burger! Dig into a juicy burger (like the new Colossal burger!) that’s a triple-decker stack of toasted brioche bun, cheddar and Swiss cheese goodness made with USDA prime meat. Your birthday burger coupon (valid for 14 days) covers up to $9 of your favorite Ruby’s burger. Sign-up bonus: When you join the Ruby Tuesday “So Connected” club, you’ll land a free appetizer coupon (up to $10) with any adult entrée. The coupon is valid for 14 days from the date of sign up. No minimum purchase required here! Celebrate your big day with a free regular Jersey Mike’s sub AND a free 22 oz. fountain drink. The only hitch: the offer is only valid on your birthday and you’ll need to present photo ID when redeeming the coupon to claim your reward.